Writing for AllAfrica, two former African leaders, a leading member of the United States Congress and top U.S. diplomats under both Democratic and Republican administrations record their worries for the development of democracy in Zimbabwe. As the leaders of the joint International Republican Institute (IRI) and National Democratic Institute (NDI) international delegation observing Zimbabwe's July 30 presidential election, we have closely followed developments on the ground. Two of us led a joint NDI-IRI post-election delegation that assessed the electoral circumstances as of early September, and the joint observation mission's final report is to be released this month. It is beyond dispute that the massive voter turnout on July 30, irrespective of other considerations, demonstrated that Zimbabweans want a transition away from the divisions, brutality and economic ruin of the Robert Mugabe era. Zimbabwe, however, has not yet established a process that treats all political parties equitably and allows citizens to be confident that they can cast their votes and express political opinions free from fear of retribution. As a consequence, Zimbabwe's democratic trajectory is not certain, and the international community should remain vigilant and engaged in supporting the people's call for a genuine transition. Zimbabwe's elections took place in the context of 18 years of political repression and electoral violence that required extraordinary efforts to establish public confidence that voting would be free of coercion and competition would be fair. The process unfortunately did not make that mark. A number of issues caused deep concern, including: credible questions about the independence of the Zimbabwe Electoral Commission (ZEC); inordinate media bias; intimidation of voters; partisan actions of some traditional leaders (chiefs and headmen); politicization of food aid; the low number of women candidates fielded; circulation of false information in order to undermine confidence in voting secrecy; and under-registration of the urban population in the voters roll. The electoral commission also placed the incumbent in an advantaged position on the ballot, and, while taking some positive steps, did not provide adequate transparency in important processes, including ballot production. On Election Day, voter turnout of approximately 85 percent demonstrated the populace's enthusiasm for viable elections and desire for democratic governance – though in such a close election, even relatively small problems can have meaningful consequences. In the densely populated urban areas of Harare, for instance, observers noted long lines at some polling centers with confusion among voters about which sub-polling place was theirs. Citizen observers noted that people who were turned away for not being on a polling place's voter list were concentrated in Harare, and they reported high-levels of assisted voting, which could compromise secrecy of the ballot. The ZEC released presidential election results in the aggregate on August 3 and within 24 hours provided polling station level results on CD-ROMs to stakeholders, which allowed independent analysis of the results. Statistical analysis by citizen observers, who also noted pre-election and Election Day problems, found the ZEC's announced presidential results to be within a credible statistical range, though the margin of error indicated that a presidential runoff election was also within that range. The immediate post-election period was seriously marred on August 1 by the excessive use of force, when the Zimbabwe Defence Force opened fire, killing six individuals, as it quelled protests over the ZEC's delayed reporting of presidential election results. That period was further tainted by a crackdown that included credible reports of reprisals against opposition activists in certain parts of the country and calls for the arrests of senior opposition officials, including newly elected member of Parliament and former minister Tendai Biti. The dispositions of such cases are still pending. Zimbabwe's Constitutional Court validated the slim margin by which incumbent President Emmerson Mnangagwa, standard-bearer of the long-ruling ZANU-PF, avoided a runoff against the main opposition contender, Nelson Chamisa of the MDC Alliance. The proceedings were televised as a transparency measure and were conducted in a respectful manner. The reasoning of the Court is yet to be published for the public to review. The electoral courts have yet to resolve challenges to the results of several parliamentary and ward councilor elections, and the Commission of Inquiry into the August 2 violence has begun to schedule meetings but is not far into its work. The electoral process is thus not fully completed. It is clear from our combined experience that it is imperative for Zimbabwe's government to redouble its efforts to instill confidence in the public that those who govern the country are truly committed to advancing a genuine democratic transition. Strictly protect the constitutional rights of citizens to associate and to peacefully assemble and protest free from excessive use of force by state security forces, including prosecuting those responsible for the August 1 shootings of protesters by Zimbabwe Defence Forces. We call on Zimbabwe's leaders to honor their stated commitment to build a "new Zimbabwe", to make a true break from the past, and take decisive actions to advance the country's democratic transition consistent with its people's expectations. 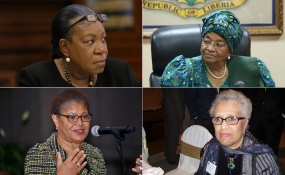 Ellen Johnson Sirleaf was President of Liberia; Catherine Samba-Panza was Interim President of the Central African Republic; Karen Bass is the Ranking Member of the US House of Representatives African Affairs Sub- Committee; Constance Newman and Johnnie Carson each served as Assistant Secretary of State for African Affairs, respectively, under President George W. Bush and Barack Obama. Johnnie Carson and Constance Newman co-led the IRI-NDI post-election delegation to Zimbabwe from September 4 to 7, 2018.